Looking for a healthy, tasty, and impressive dish to serve friends and family? Or perhaps you’re interested in preparing a salad that will serve as lunch for an entire week. 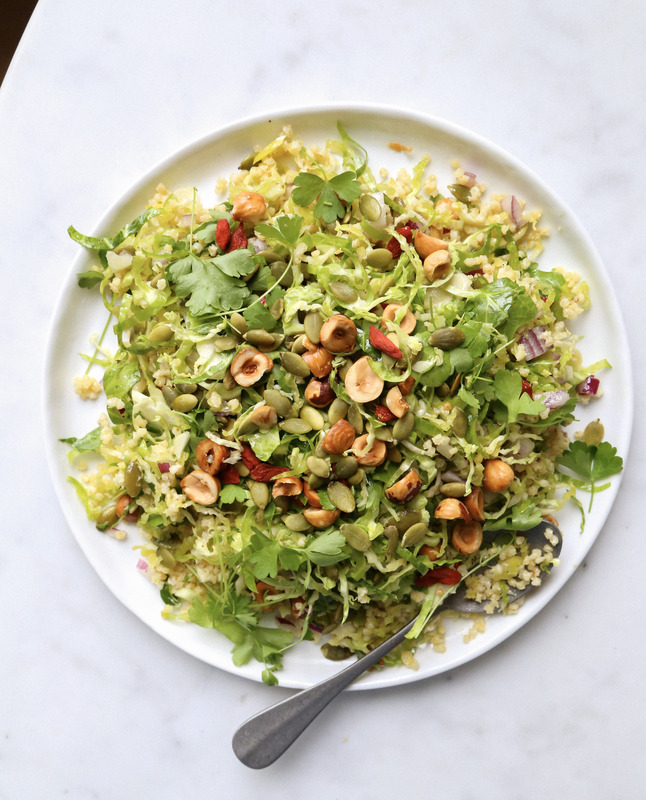 Whatever the occasion, I got your back with this recipe for Brussels Sprouts + Millet Salad with Umeboshi Vinaigrette! Colder weather means more local and hearty vegetables to enjoy such as broccoli, cabbage, turnips, and brussels sprouts, also known as the brassica vegetables. These are the perfect vegetables to cook during the colder months for a warming and comforting meal. However, the onset of autumn this year has welcomed some warmers days that beg for fresh and crisp salads with raw ingredients. My recipe is perfect for this stage because it welcomes fall brussels sprouts and serves them raw. When brussels sprouts are shaved with a mandolin they make for the most delicious and crunchy salads. The superstar grain, or rather seed, in this recipe is millet. With so many quinoa recipes floating around I thought it was time to experiment with other grains. Similar to quinoa, millet is super nutritious, gluten-free, and a breeze to make. Fun fact: It’s believed that millet was eaten in ancient China before rice! The vinaigrette sets this recipe apart because of the notable ingredient: ume plum vinegar or umeboshi vinegar. This vinegar is the leftover pickling liquid of umeboshi or salty plums, which is commonly eaten in Japan with rice. Umeboshi vinegar has a very unique and addictive flavour because it’s super salty, sour, and fruity. It’s not like any other vinegar you have ever tried! Look to purchase Eden Organic brand because it’s made using traditional Japanese methods with no added preservatives or food colouring. 1/4 cup goji berries, soaked in hot water for 10 minutes and drained. Begin with the millet. Toast millet in a pot over medium heat, stirring constantly, until fragrant and golden brown, about 3 minutes. Pour in 2 cups of water and a pinch of salt. Cover and bring to a boil and then simmer until liquid is absorbed and millet is tender, 20 to 25 minutes. Set aside to let cool. While the millet is cooking prepare the dressing. Whisk all ingredients together. Season with salt and pepper. Set aside. Thinly slice the brussels sprouts with a mandolin or the shredding blade of a food processor. Combine with remaining ingredients and toss with dressing. Season to taste. Serve warm or at room temperature. * Toast hazelnuts at 350° for 10-15 minutes. Cover with a clean dish towel for 1 minutes and then rub to remove skins. * Toast pepitas at 350° for 5-8 minutes. This entry was posted in Salads and tagged ancient grains, Autumn, brussels sprouts, gf, gluten-free, local, millet, organic, salad, seasonal, Vegan, Vegetarian. Bookmark the permalink. This looks delicious! I love the palate of crunchy nuts with fresh veggies! Very fall vibe here, keep it up!